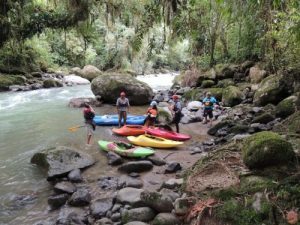 Kayak School Pejibaye River Costa RicaWhitewater kayaking is one of the most fun outdoor adventures you can do in Costa Rica. But you don’t have to be an expert to enjoy kayaking in the warm waters of some of Costa Rica’s most famous rivers. Our Whitewater Kayak Camp is the perfect introduction to those who have been itching to learn how to kayak but still haven’t taken that first step. First things first, time to learn the basics. We get your height and weight before you even reach Costa Rica so that when we pick you up from the hotel we will have your kayaks waiting for you along with paddles, helmets, lifejackets and spray skirts. After picking you up from the hotel we will head off to one of our favorite rivers, the Pejivalle. On the beach next to a large eddy we will work with you to make sure your kayak is outfitted correctly. Having a tight fitting kayak is very important to learning how to kayak since so much of the techniques necessary deals with using your hips. After getting you tight and comfortable in your boat we teach the most important thing: how to get out of your boat. This simple technique is called a ‘Wet Exit.’ After just one time practicing the Wet Exit (it’s a very simple move) its time to start learning how to roll the kayak. Working through a series of steps we will teach you the hip snap, the set up, the hands roll, head and shoulder position and finally how to roll with a paddle. It’s a little complicated at first dealing with being underwater and how to oriented yourself while you’re upside down. This is where being in the tropics is nice. The water is warm and the air is warmer so there is no reason to give up like there is when you learn in a cold river in the US. Sometimes people pick it up in a few tries sometimes it takes a few practice sessions. Either way we will work on these skills until you feel comfortable. After that it is lunchtime and a short rest. After lunch its time to start using our newly learned kayaking skills. We will travel up the river about five miles to the put in. Here you can make the call to make the descent through the numerous class II and one class III rapid in your kayak or with a slightly more forgiving inflatable kayak. Surrounded by guides we will teach you the basic paddle strokes, how to read the water, make eddy turns and general rules of the river as we make our descent. Even if you don’t have a flawless run, a swim is nothing to worry about and makes a great story to share afterwards. Learning the essential skills necessary to kayak in a fun, warm and forgiving environment is a great first step on the path to your new favorite extreme sport, whitewater kayaking. Are you looking for just a one day adventure, not a multi-day custom adventure package? 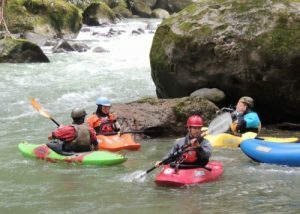 Check out Green Frog Rafting – Costa Rica Whitewater Adventures.